It's December and time to bake. According to old Norwegian customs and traditions, a household should bake no less than 7 different kinds of Christmas cookies. Christmas was special in olden days and nothing was spared. The best ingredients and TIME should be spent preparing for the holidays. Every home prepared in their own way, the country farms would bake their own, but there were also professional baking folk, women went from place to place, offering their experise, The baked for those who could afford to pay. 7 different kinds. Which baked goods varied. I asked my mother-in-law about her Christmas baking. What did she do with seven children and a busy household? "I baked 13 or 14 different kinds," was her answer. I believe it. She is amazing, always doing her best to make traditions a special treat for her family. I asked her which kinds she baked. She started on her list - goro, krumkake, fattigmann . . .
By the time she had listed all the baked goods she made for her family for Christmas, I had counted 15 different kinds. Today my mother-in-law is 90 years old. Still busy. Still making us feel welcome at Christmas time or any time of the year. the whole house is filled with the smell of Christmas. 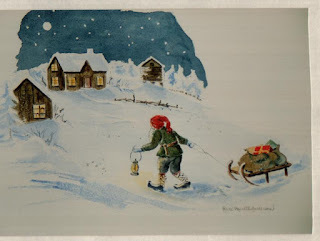 Today's water color is a traditional Norwegian "nisse", bringing presents to the people in a small farm.